This classic greek salad features herbed tofu instead of feta. This tricky and much-appreciated tip comes from Catherine Dorrell in VegNews, a magazine I picked up for the first time this past week. This herbed tofu is fabulous with that salty, lemony, briny flavour that makes feta such a popular addition to salads and such. Put this alongside the falafel burger, a glass of rosé, and a backyard patio, and, presto, you’ve got summer. 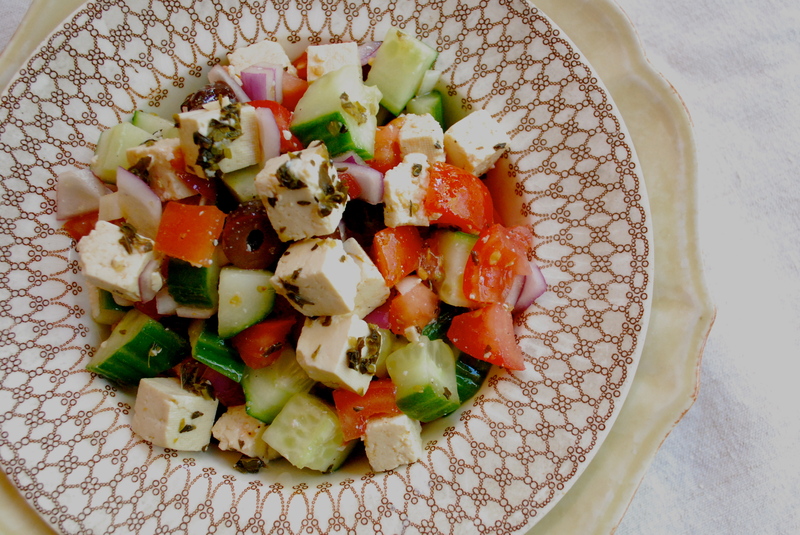 In a large bowl combine herbed tofu, cubed cucumbers, tomatoes, and onions. Add chopped olives and then toss with olive oil, red wine vinegar, and lemon juice. Add sea salt and pepper to taste. Toss again, and serve. I love the idea of a bright, salty brined tofu–can’t wait to try this! It’s really tasty. It might just become a new favourite in this house – especially as we head into tomato season! PS I’m going to try it in spanikopita as well. Stay tuned….